Rome is the capital and largest city in Italy. 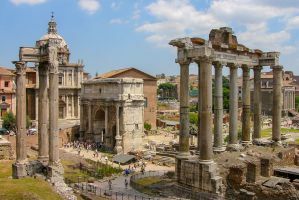 Many visitors begin and end their trip in Rome, and there is no shortage of sights and attractions around town. The city is famous for the Roman Empire, the Seven Hills, La Dolce Vita, and the Vatican City. It's also a large and somewhat chaotic city that has a rich history, delicious cuisine, and impressive art and architecture. You'll find many different accommodation options near the Termini Railway Station. On one side you'll find mainly large hotels that are popular with groups and organized tours. On the other side of the station you'll find a lot of smaller and more affordable hotels and hostels. These options are popular with independent travelers and backpackers. There's a wide variety of different options to choose from. Some hostels are designed for a party crowd, while others are more low key and mellow. 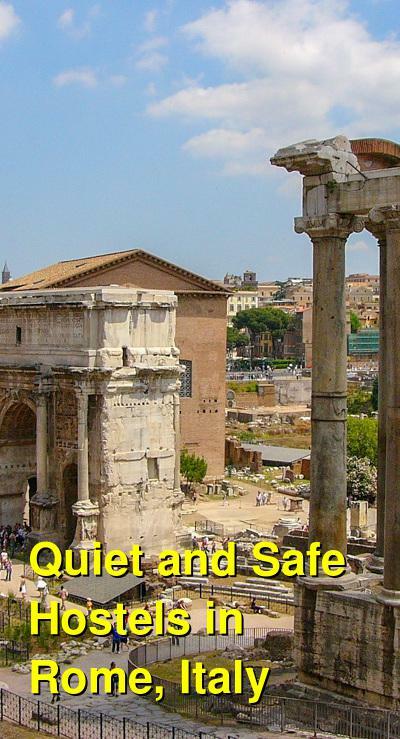 If you're looking for a relaxing, quiet, and safe hostel in Rome, Italy, several good options are listed below. A great hostel for solo and female travellers. Hostella is a small and quiet hostel that is a friendly and welcoming place to stay in Rome. It's the perfect place to return to after an active day exploring the city. The hostel has several different room types to choose from including three and four bed dorms as well as twin private rooms. There are all kinds of amenities available to guests. There is free wi-fi, air conditioning during the summer months and heating during the winter months. Breakfast is available in the morning and there is luggage storage for when you arrive or check out. The staff here is wonderful and they are often young travelers themselves so they can help you with any information you might need. If you want to meet some other guests or just relax with a good book, there is a common area with a television. There's also a kitchen that you can use to prepare your own meals. Every guest gets a security locker as well. This hostel is also conveniently located near the train station. It's about a thirty minute walk to the Colosseum and there are buses nearby that can take you anywhere. A relaxing and welcoming place to stay in Rome. Another great option in Rome is Dreaming Rome Hostel. It's located in the middle of the city, about a mile from the Colosseum and close to Metro San Giovanni. This is a charming place to stay that is quiet, clean, and safe. They have comfortable rooms and a great breakfast that is served every morning. The hostel has all kinds of amenities available for guests including free wi-fi, free maps, laundry facilities, and more. There are four bed dorms, private doubles, and private triple rooms to choose from. The hostel also has a communal kitchen that you can use to prepare your own meals. There's a common area where guests like to hang out, but this is not a party hostel, so you can be assured a good nights sleep. This is a family run hostel that is friendly and respectful of all guests. They prepare a dinner most nights that is quite delicious. They can also help you organize tours of the city or any transportation that you might need. If you're looking for an affordable, safe, clean, and fun place to stay, then Dreaming Rome Hostel is a great option. A good hostel for couples, families, female travellers, and groups of friends. Blue Hostel is another good option if you're looking for an interesting and relaxing place to stay in Rome. It's located in a former convent that was built during the 17th century and it is walking distance of the Colosseum along with many other popular sights around the city. The hostel has double and triple private rooms available as well as an impressive designer apartment that sleeps up to four people. This a great option for couples, families, or friends who want to stay somewhere affordable, quiet, and safe. Every room in the hostel has an attached private bathroom, air conditioning, a television, and free wi-fi. The rooms are clean and comfortable and the staff are very helpful. If you're looking for a quaint and independently owned place to stay that is removed from the mass tourism crowd, then this is a good option.